A useful and delicious bounty of 10 different kinds of chukadon ingredients. Our chukadon ingredients can also be used as ingredients in gomoku yakisoba (stir-fry soba), chuka soba (Chinese-style soba), or other dishes. Simply remove outer bag, boil in inner bag, and enjoy. Each package is 400g (2 bags, 200g each) and arrives frozen. Chukadon is a type of donburi dish. There are many types of donburi dishes in Japanese traditional cooking, each consisting of a different combination of ingredients atop a bowl of rice. 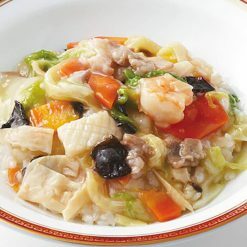 Chuka means “Chinese,” and chukadon is a donburi dish with Chinese-style ingredients. This item contains a delicious bounty of 10 different kinds of ingredients, giving you nearly everything required to make your own chukadon – all you need to supply is the rice! If you have never had napa cabbage or kamaboko before, this dish is a perfect way to try them. Napa cabbage is a variety of cabbage from China, very leafy and less crunchy and crinkly than the type of cabbage often used in the West. Kamaboko is a type of processed fish cake that can be cut into slices and added to noodles or other dishes. Remove the chukadon ingredients (still frozen) from their outer bag. Place them, still in their inner bag, in boiling water; and cook for about 10 minutes. Then, pour the bag onto warm rice, and your delicious chukadon is ready to eat! 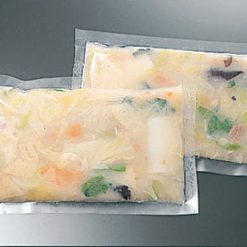 This product contains vegetables (cabbage, napa cabbage, bamboo shoots, carrots, Welsh onions), shrimp, pork, squid, flavoring extract (pork, chicken, yeast, wheat gluten, Japanese scallop), potato starch, sesame oil, soybean oil, kamaboko, table salt, sugar, refined sake, oyster sauce, cornstarch, wood ear mushrooms, egg whites, pepper, gardenia colorants, red yeast rice colorants.. This product is not suitable for anyone with allergies to egg, wheat, squid, shrimp, soy, chicken, pork or sesame. Origin of ingredients: cabbage, napa cabbage (domestic), bamboo shoots (China). Prepared and packaged in Japan.